In England this period is often called the Georgian Period (because of the kings had the name George) and correlated with decorative arts of that same name. While man power was still the most important source of production, new inventions in farming and manufacturing were slowly changing lifestyles. People were gradually moving away from the country to towns and cities. The sudden influx of people lead to poor sanitary conditions. This is a century of contradictions: It seems to harbor the most frivolous of events and lifestyles, yet at the same time with some of the same people discussions of deep seated needed social changes such as the role of children, the condition of the poor. Voltaire and Rousseau were favorites at the salon of Mme. Pompadour. The fashionable society and the court were interested in cultivating the intellectual wit, the art of conversation, manners were essential, engaging the five physical appetites, while morals were optional. Political governments of the time: In England the rulers are William and Mary who rule jointly until 1702, and then Anne comes to the throne from 1702 until 1714, George I from 1714 to 1727, George II from 1727 to 1760 and George III from 1760 to 1820. England continues to expand her colonies from not only America but to Canada and India and thus becomes a world power. France continues to be ruled by Louis XIV until 1715, then Louis XV from 1715- 1774. Louis XVI rules from 1774 until he is beheaded during the French Revolution in 1792. (His wife is Marie Antoinette) The Republic was from 1792 to 1804. This is the century of the three Louis for France. The French are leaders in decorative arts, fashion, and elegance, but have ignored the state of the lower classes. In Spain Philip V rules from 1700 to 1746, Ferdinand VI from 1746 to 1759, Charles III from 1759 to 1788, and Charles IV from 1788 to 1808. The United States declares its independence from England in 1776, engages in the Revolutionary War and it’s first president, G. Washington is in office from 1789 to 1797, followed by John Adams, 1797 to 1801. Wars take place over the Spanish Succession, War of Austrian Succession, Seven Years War, Russo-Turkish War, Great Northern War between Russian and Sweden, the American Revolution. There are many changes during this century. The Industrial Revolution is taking place in England at the beginning of this century. This was a change in the methods of manufacturing, out of the home and into factories. Its importance is in the fact that it enables more goods to be produced, changed lifestyles, changed social classes and economic dependences. Increased trade with the Middle East and Far East influenced the production and the aesthetics of textiles. Lighter weight fabrics with small scale patterns were produced and enjoyed high fashion. Light weight silk taffetas, printed cottons and lawns, There were laws prohibiting the importation of printed cottons or indiennes but the laws just made those fabrics more desirable. 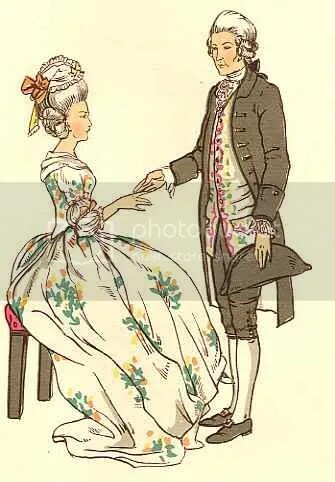 Many embroidered silks were still used, especially for court wear, but the lighter weight and pastel colors were definitely the fashion for the 18th century. Fashion is important for the French economy as it produces laces, brocades, and all kinds of silks. The court is self-centered ignoring the right of common man. The styles of the late 17th century continued on into the 18th century until the death of Louis XIV. 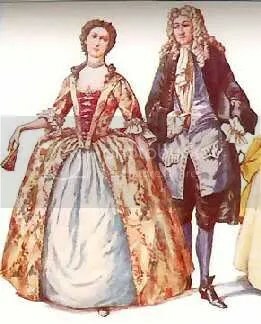 During the 18th century the French court is constantly changing styles and we can see these changes in the female skirt silhouette that takes on six definite shapes. You might note that many of these styles are overlapping and not all happened in all countries. For example, the pannier style did not catch on in England. The very full ruffles on the sleeves are called engageants. They are used by both English and French. The neck is square and low, the sleeves to the elbow with engageants falling from the end of the sleeve, echelles or a row of bows covering the stomacher. There is an abundance of small bows or ribbons. These are much more delicate than the ribbons and bows of the 17th century. In the mid century the women began to add hair pieces so that their hair became quite dramatic and high. (See Figure 15.) Generally this was for important occasions, not just for their daily routine. Their hygienic habits were still not up to our standards, and they needed to hold the hair in place with glue, flour paste, rice paste, and other natural substances. And, then they often powdered the wigs with flour to add whiteness. Since the hair was not washed frequently, you can imagine the small creatures that nested in the hair. A small gold cage with a sticky substance was often inserted into the hair to “collect” all of these creatures. Not only was the height of the hair important but the color as well. White was favored, especially for evening occasions. To get the white they often powdered their hair with flour and other white substances. Often a powder room was found near the front door of a house. In it powder fell from a container from the ceiling while a piece of wood protected one’s clothing and put a fresh powder on one’s hair. Thus the term “powder room.” At the turn of the 20th century it was the place to powder a female nose. The men continue to wear the justacorps, the waistcoat, the shirt, the breeches, and the cravat or jabot. However, the justacorps and waistcoat gradually diminish in size. The justacorps is full at the hem in the beginning of the century then the center front curves towards the side seam and diminishes in fullness. It is called a frock coat. You can just see the breeches worn under the frock coat. The white shirt, velvet breeches, embroidered frock coat, and lace cravat are all part of the early 18th century. His hair is in the ramille mode, a wig pulled back into a pony tail or queue. At this time children were still considered miniature adults (see Figure 23), but during the early and middle part of the century naturalists and philosophers were changing many view points. One of which was the changing attitudes towards children, so that by the end of the century attitudes are more akin to how we view children today. The use of accessories was important. While heavy precious jewels were not common, light weight fabrics, ribbons, bows, and laces found their way into garments. Canes and fans were popular accessories as well. Many men carried canes and women used fans at every opportunity. They were popular at balls for the way one carried, tapped, or fanned with the fan conveyed secret messages to others. A calash which is a collapsible hood used to pull up over the heightened hairstyle so the hair would not get crushed. There are wire bands sewn into the curve of the hood. The lace umbrella and the shoes are obvious. The top left photo is a corset. You can see the loops and laces which are pulled tight and hold the two sides of the corset together. Below that photo is a stomacher. This highly embroidered triangular piece goes over the corset to hide the laces. Popular fabrics were light weight Brocades as seen in Figure 19 and damasks, toiles which were printed cottons from India. They were sometimes known as indiennes and generally had a light backgrown with small floral or exotic floral prints. Technology or the knowledge of making dyes adhere to fibers was lacking in Europe until the early 18th century when some travelers smuggled in the process to European textile printers. Taffetas were popular for evening wear. Velvets and other pile fabrics were used but often embroidered or used with lace. The man has a ramille and the queue in the back is covered with a black bag. This is sometimes referred to as a bag wig. Most of the women’s garments were manutas, or dresses. However, women might also wear a jacket of some sort , pet-en-lair, with a separate skirt. styles throughout the 18th century. How do you account for this change? In the 17th century, much of the influences in clothing and art came from Louis XIV and was continued on to the 18th century. The Baroque style was achieved in the 17th century,But after the death of Louis XIV in 1715, the Baroque style became less massive, slender curves, and asymmetrical balance. Thus the Rococo style came into play in the late 18th century with it’s revival of the classic influences of the neoclassic period. Clothing manufactures were well established during this time. With the men’s style, the fullness of coats and side pleats were eliminated and the focus was directed more on the coat with heavy embroidery. More simpler garments like the frock coats made for country wear. However, the women’s style was much more complex. What was formally known as the sacque, the robe a la Francaise was full and pleated in the front and the back. Skirts were wide with a frame called panniers. During this time, technology had improved. Technology expanded the textile availability at lower costs. Changes in garments from this period were influenced by international trading from India and china importing finer fabrics. Thus this could have determined social class with the finer fabrics. An excellent post, well done. I have noticed that fashions for men in the New World colonies was slow to change, at least for those that were not actually conserned with fashion so much as practicallity or simply a preference for older styles. This was also more so with older men. TRY THIS IN TWO POSTS!!! their clothing and equipment should be dated to 1760. Sorry about all these bits and pieces, I think it is because I included my Blog address!!! And it does not like it for some reason!